assisted coaching with horses, how it really ?? 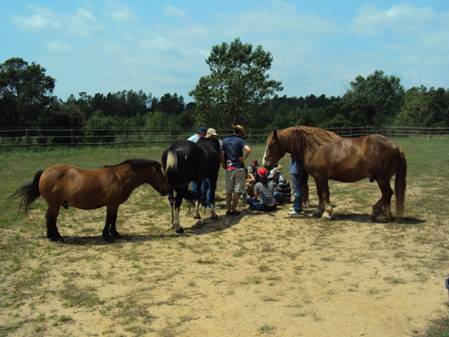 Directed by Coach entitled specialize in horse-assisted coaching, so also is a specialist equine. He horse is present in all sessions, and client may or may not have any previous experience with this animal. The client always feel comfortable with the animal because it can develop the sitting so close or as far as the animal is comfortable in both. almost cap-case they mounted the horse. The sessions are outdoors, so that the user is in a nice setting, in touch with nature, you can move freely, walking, running, stretching, feeling the ground, jump, scream .... what you need. The methodology helps to open up the five senses, to relax, to enter the time'NOWAnd using our most emotional Serena some rationality to our exalted. In short, being more horses ... and less human. The horse is a prey animal, and as such, has highly developed capabilities to detect emotional changes, interpret nonverbal language and attitudes of trust / distrust, consistency / inconsistency, calm / nervous; so you can survive and escape from predators as we are. The horses only live one time, which is the present life are connected with the five senses, without losing a single detail of the ARA ever. Do not judge or discriminate, are fair and consistent with their thoughts, feelings and actions. They have no compassion, nor grieve, not raised because of what happens, but you choose: action-reaction. Therefore, during the Coaching sessions attendedThe horse always reacts to emotional changes, and body of the user. He CoachAccording to achieving the goals they have identified the user, dynamic and offers different activities with horses. He Coach observes an objectively what is happening, and expresses the customer in the form of powerful questions that encourage reflection and search for solutions. At the end of each coaching session attended a compromise is agreed or mini-challenge to achieve by the customer ahead of the next session, to be sure growing closer to the ultimate goal. Coach: The horse walked steadily until in that cone, which told me that you fear ... represented. there has stopped, suggests something? This entry was posted in Coaching with horses, assisted coaching horses, animal assisted interventions.. Bookmark the permalink.